Below are student testimonies to why they chose SDSU! Why SDSU: Simply, the people. This has been one of the most enriching and vibrant experiences of my life. The faculty care so incredibly much about the success and wellbeing of the graduate students and that is manifested in a variety of ways, from the seminar discussions to opportunities to conduct research with them. Secondly, your classmates, at SDSU you will be among some of the best people AND students. It has been a truly remarkable and humbling experience to be able to study with what I think are the most intelligent, kind hearted, friendly, and hardworking classmates. Everyone celebrates one another’s success and everyone is truly excited for one another. As a graduate student, you will have an incredible opportunity to build meaningful lifelong relationships with your fellow classmates. As a GTA you get a first-hand account of what it is like to be a teacher and to have your own classroom and students. It is a humbling and satisfying experience to not only impart knowledge on young minds, but also to encourage them along their respective academic paths. It is such a wonderful experience to watch the students improve and gain confidence as the semester goes on and to know that you were able to help them along in that process. One of my teachers recommended SDSU to me. She knew I wanted change in my life and said SDSU would be a perfect fit. I competed on the ISU Forensics Team for four years and I knew I wanted to coach for a team, to be able to spread all the learning I received onto other students. I’ve been working with the SDSU Forensics Team for only one semester and I’m in love with coaching. One of the most fulfilling things about this program is that I get to watch students grow as communicators, and to be able to help with that process is even more rewarding. Why SDSU? The better question is: Why not? The breathtaking city and 75 degree and sunny weather makes San Diego State the best place to receive your MA in Communication. Between studies and exploring the outdoors, there is never a dull moment in this colorful city. Also, what could be better than teaching and sharing your passion with others? Working as a Graduate Teaching Associate is an unbelievable opportunity for those interested in pursuing the world of academe or simply passionate about being involved in the campus community. This experience allows for you to work closely with the SDSU Communication faculty, as you experience both the teacher and student roles. 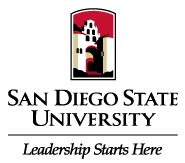 The San Diego State MA program in Communication will be the best choice that you ever made!